Tara, a Customer Service Representative, created another upcycled DIY project, this time using a square foam block from a coworker. Tara is always collecting materials waiting for inspiration to strike on how to reuse it to create a work of art. The foam block always reminded her of ice because of its color and she imagined that the material would diffuses light well into a warm glow - so inspiration struck for the holiday themed DIY competition. Tara crafted a musical box that looks straight out of the North Pole. 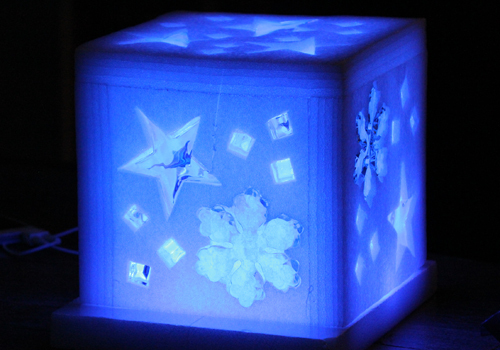 Tara carved out the foam to insert the various translucent decorations into the box to let the light shine through. Plug the Apollo Jammer to your favorite Christmas playlist and you'll have a jingle bell rockin' time.